R&S Grating work to the Australian Standard for Access Covers and Grates, AS3996 – 2006. The standard sets a series of load classifications for products based on the anticipated load. These classes range from extra light duty (Class A) through to extra heavy duty – G (Class G). Below is a summary of the load classifications, including areas for their intended use. Read more on AS3996 - 2006. Confusion can arise about what size is actually being measured on a product. Unless specified, all R&S Grating size measurements are the pit size (often referred to as clear opening size or internal size). All measurements quoted by R&S Grating are in mm unless otherwise specified. Read more on pit size. When choosing an access cover, the insert size should most closely match the pit size of the pit. 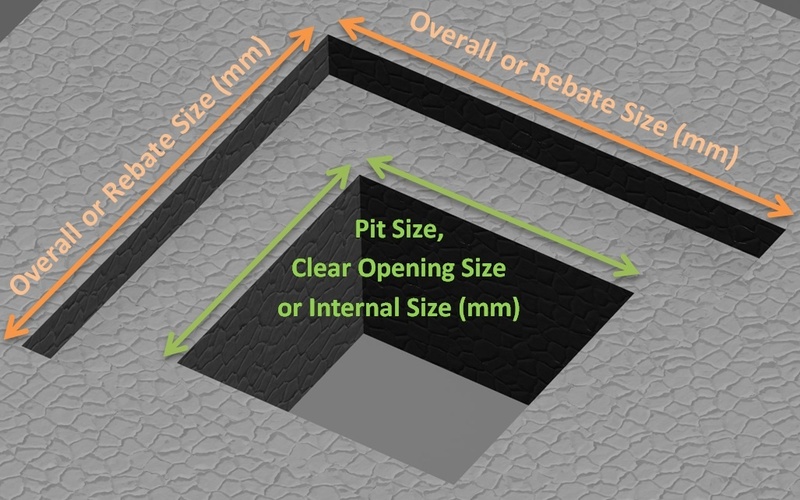 There is usually a little variance between the pit size and the insert size, however the frame size should be significantly larger than the pit size (or clear opening) to ensure that the frame is completely outside of the pit, thus providing stability for the insert once the access cover is installed. The frame and insert sizes of each access cover is listed in the 'Product Specifications' tab for each individual access cover. Read more on frames and inserts.